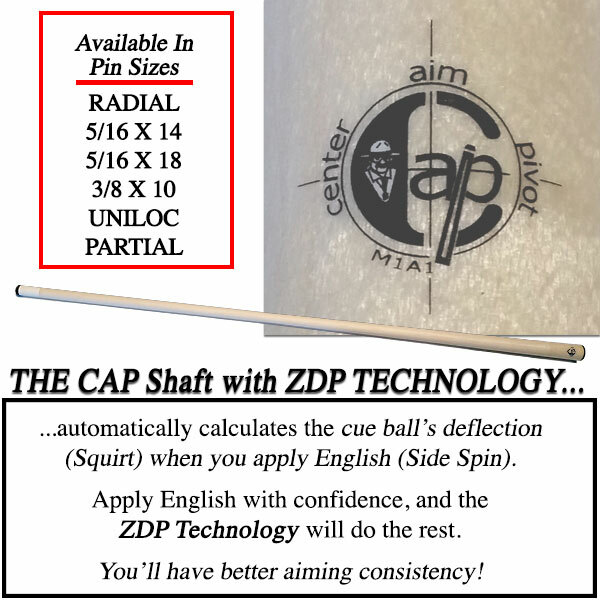 Announcing the first ZERO DEFLECTION PERFORMANCE CUE SHAFT in the history of pocket billiards: The CAP Shaft (Center Aim Pivot). Up to January 1, 2015 The Drill instructor had spent 9 full years proudly endorsing and promoting the PREDATOR pool cue shafts for it’s many claims of low deflection and design quality. But all good things do come to an end to make room for better. The Drill Instructor has perfected the first pool playing cue shaft that finally has — Zero Deflection Performance, ZDP Technology. The BIG DEAL is not what the shaft is made out of, but how it performs. It’s all about WHAT THE CAP SHAFT CAN REALLY DO! Why would you want to shoot pool with ZDP Technology? ZDP Technology automatically calculates the cue ball’s deflection (Squirt) when you apply English (Side Spin). And what does that really mean for you? You will definitely have better aiming consistency! 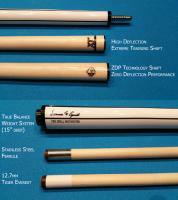 No other cue shaft in the world can perform like this. Apply English with the CAP shaft, with confidence, and the ZDP Technology will do the rest for you. The CAP Shaft comes with a 100% no-warp replacement policy. I recently purchased the CAP shaft and I'm really enjoying playing with it. Making shots I couldn't before with my other shaft.